Ruth Noack is a German art historian and curator. In 2007, she held the post of curator of documenta 12 in Kassel, while Roger M. Buergel served as artistic director. As the two state in the preface to the exhibition, it ‘was organised around three leitmotifs: modernity’s fate and legacy, the biopolitical turn and aesthetic education as a possible alternative to both commodity fetishism, and the complacency of critical studies.’1 Based on the presumption that exhibition is a medium, Noack and Buergel defined, as the organizing principle of documenta 12, the migration of form. Regarding the multiple and diverse modernisms, Noack develops a political interpretation of formalism, as she puts it, politicizing the line. Analyzing the works of Lygia Clark, Sheela Gowda, Eva Hesse, Trisha Brown, Chantal Akerman and others, Noack writes: ‘Each line is born of history and pain,’ not being able to be considered as a neutral abstraction. 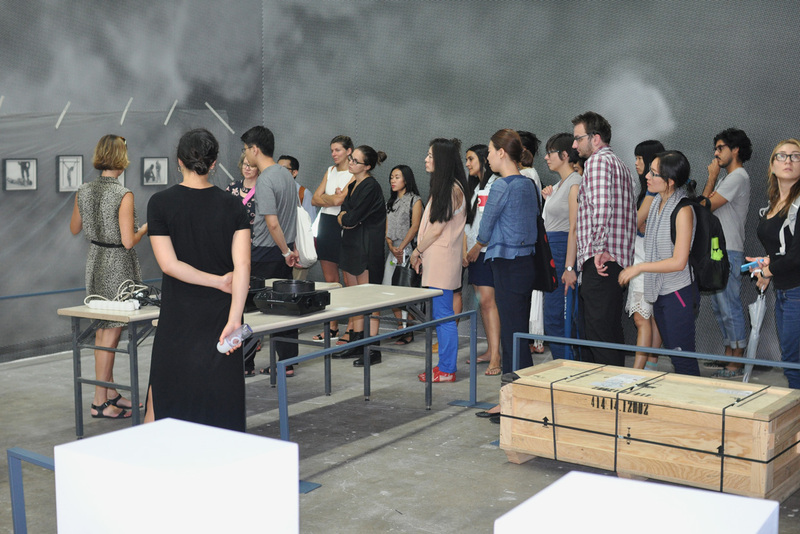 In 2014, Noack was Visiting Professor of the sixth edition of the Gwangju Biennale International Curator Course (GBICC), leading the program on the dynamics of thinking through art. The interview below by curators Manoel Silvestre Friques and Renan Laru-an was held on the occasion of this course, on 5 September 2014, and continued through e-mail until June 2015. Listening to Jessica Morgan talking about work she is installing at Gwangju Biennale. Notes on "Crisis, Currency and Consumption", Vienna, September 2015. 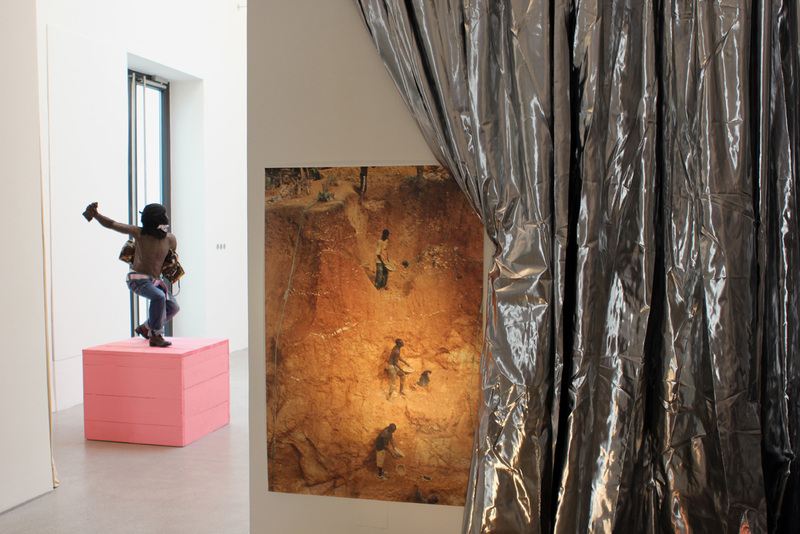 Exhibition view with George Osodi, "Ghana Gold - De Money" (2009) and Ines Doujak, "Not Dresses For Conquering, HC 04 Transport" (2015). Learning about Korean art history at the National Museum of Korea in Seoul. Manoel Silvestre Friques and Renan Laru-an: Education was one of the three ‘leitmotifs’ of documenta 12. During the GBICC, we have talked about the ongoing professionalization of the curatorial field. 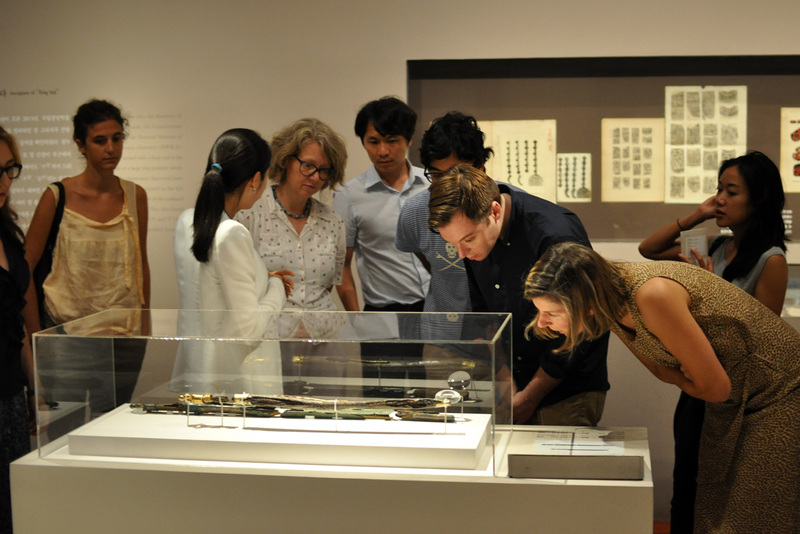 Is it possible to teach curatorship or how to be a curator? Ruth Noack: I am against professionalization, but for education. For me, education is a space of – should be, or ideally, at least – freedom to develop, think, examine and question. It should be a space that does not follow the rules of productivity, so it is not about assimilating some kind of knowledge, but about creating situations, which may be produced together through critical thinking and experience in communicating with each other. Nowadays, education is seldom like that. Most of the curators I admire never went to a curating course. Curatorial courses are frequently geared toward making the kind of individuals who will just oil the machine, who will not be so interesting. As one of your colleagues stressed during the GBICC, curators must stay different. In connection to professionalization, we initially discussed alternative ways and alternating forms of working. We have been thinking about how different generations have specific ideas on labour in the curatorial field. Could you please comment on the generational specificity of curatorial labour? What do you think about the contradicting positions of established and emerging curators toward sustainability, survivability and job security? Instead of building new models together, we mostly adhere to the given institutional forms of organization, which assume a pyramid form. There are simply too many curators produced to fit this model. Meanwhile, the economy of curatorial education remains based on the myth that each student will one day fill the top spot of a pyramid. Basically, this widening of the gap between fantasy and reality is a problem. Creating a large pool of curators makes everyone, including the older generation, ever so much more precarious. However, don’t kid yourself. Even the so-called star curators are mostly precarious. The model of the ‘independent curator’ is a false ideal. They are probably the most dependent because of economic reasons: you’re making a show in order to exist to make the next show, a cycle which can never stop. It means that people can get tired but scared to stop, because they are afraid that they might fall off the face of the earth and not be able to get back on. Thus, everything becomes the same formation. Having said that, there have always been people who have done things differently. That in itself is not a question of generation. One thing about your generation seems to be the awakening awareness of the threatened ecology of the curatorial system and a pragmatism that comes out of it. A young generation needs to be building different models. Established or older ones have done so individually. I am really hoping that you will find ways to organize together and build models together, rather than just be individuals. That’s the most dangerous thing [working individually] because that makes it most difficult for everyone. Considering the lack of jobs, what shall all these professional curators be doing with themselves once they have graduated? This question is exacerbated by the demise of the system of higher education itself. When curatorship is taught within an educational infrastructure that measures the value of educational content and thought according to a political bureaucracy’s idea of ‘impact’ and ‘application,’ what will the chances be that students will value difference, failure and experiment? In parallel to conditions of professionalization and precarization is the reliance on the digital, for instance ‘computer-based’ / ‘working from your desk’ curatorial practice. We don’t have concrete and spatial relation or reference with artworks anymore. That is simply an administration of art. I personally wouldn’t be able to curate without the artworks, meaning their presence and voice. It is easier to interact with works that are very strong, because they actually ‘talk back’ – they resist. In any case, they are not tamed by my curatorial will. My method mimics certain aspects of art historical analysis, but most importantly it presupposes that an artwork cannot be known. We can only pose questions to it and compare and contrast by assembling several works in a group. It would be boring to use works simply to make a point, an argument. Instead of serving as illustrations of a curatorial folly, artworks might somehow lead viewers in other directions, and then the show might become quite interesting. I can‘t work through digitalization, because so much of actual materiality is lost, unless I am dealing with digital art. But curatorial work has always been managerial, or at least is always seen as administrative in the neoliberal logic of the art world. How do we account for this administrative and communicative work of curators in a hyper-networked art world, where marketing and public management skills have become necessary for curators working in institutions and freelance? These skills are also taught and encouraged, if not prioritized in curatorial programmes. Whose art world are you talking about? Think of a few shows that have really impressed you and then repeat that statement. Does it still sound true? The homogeneity that your statement implies is a fiction. Moreover, the cogs of administration are usually oiled with something that can stand in for the ‘contemporary’ or even the ‘new,’ a fashion or fad. Lately, it has been called ‘curatorial ethics.’ So, even the mainstream does not live off on administration alone. Curatorial practice has forged new alliances. Peter Osborne, Professor of Modern European Philosophy and Director of the Centre for Research in Modern European Philosophy, Kingston University, London talks about radical insufficiency. It is interesting to see its resonance in how curatorial practice remains insufficient, dependent or contingent on neighbouring knowledges. How do we keep it this way and how do you radicalize an insufficiency in a highly professionalized field? There is no formula. I think you have to be lucky. Very few people have perfected insufficiency or failure as a true method. What I know, I learned from my children. Generally, we think of children as adults to be, but I would claim that they are radically different from adults, even to the point of challenging personhood. Take the way very young children perceive space and movement in space and time. It is incompatible with social norms. Thus, if you take children seriously, you have to change your mindset; even more, you have to accept that not just the child, you as well, are a person in flux, being formed and unformed all the time. Willingness to be challenged is very important in curating. Being able to make that forming and unforming visible is just as important. This is where art can help you. It is important to make a form that allows this insufficiency to appear. It is not just rhetoric. It is not just deconstruction. It is really creating something that is at the same time opening up for this reflection and / or this understanding of fallibility, but still holding together at the seams well enough so that you actually have meanings. It requires too much of affective labour, though. How would you compartmentalize this labour? How do you deal with it? I think it comes back to historicality. It helps to see yourself as one person within a community. It might not be a community of friends or people you talk to and exchange with, but a community of exhibitions. Think intertextually about the exhibitions; they are not just singular beings; the exhibitions correspond with each other. So, one person does something and the other learns from it and does something else. In that, there’s also affectivity. I remember going to the 11th International İstanbul Biennial that the curator collective What, How & for Whom / WHW made. And it was the first show after the documenta 12 that somehow made me find hope again. Less than the topic itself, ‘What Keeps Mankind Alive?,’ what moved me were the artworks assembled in there. That exhibition carried me. You can take your energy from where you find it. Sometimes you will get feedback from the audience and that’s amazing. You are very critical about the practice of criticality – its employment in theory production, arts journalism, publishing and discursive platforms. We are curious about your position on how we can talk about criticality in the curatorial field. For instance, we talked about radical insufficiency, professionalization of the curatorial practice, and the kind of education that produces professionalization and precarization. How can criticality figure into this matrix? What I object to is the speech act, not the intellectual practice. More often than not, people hide behind the gesture of criticality, because they are afraid of articulating something that will be deemed wrong or naive or out of fashion. Yet in order for any political action to take place, people need to voice a position. This might be derived from criticism, but it cannot stop there. I guess that makes me still attached to utopia. The work of the curator involves creating a relationship with its public, others’ exhibitions, artists, curators, etc. What do you think of biennials including triennials, quadriennials and documenta as a format of exhibition? documenta is not a biennial. documenta is a very historically specific exhibition format that came out of a situation when Germany was envisioning itself as a new civil society. After all the crimes that Germans and Germany as a nation had committed, documenta came out of a moment of self-definition in a society through a new kind of internationalism and art. In a certain way, would even claim that part of institutional knowledge is transported by the public. It is not necessarily discursified, or it is not something that people talk about. But my experience is that the public makes documenta and not the other way around. documenta doesn’t make a public. One of the problems with biennales is that there is never enough time to do a good job curating. Moreover, the knowledge gained by one exhibition, for example how to work with the local audience, is lost from one iteration to the next. At the very least, it needs to be reacquired. Most biennials are precarious. The framework is often set from a framework extraneous to art or curating, from the city, the region, the sponsors. Seldom are biennials adequately funded, yet the idiom of a biennial tends to be ‘large-scale,’ which leads to discrepancies in production and viewing relations. Biennials are not necessarily the best mode of getting your work shown, yet, they are often the only possibility artists have to produce work. Some artists hop from biennial to biennial, they might be called ‘emerging artists’ for ten years and after that, they are dead. They don’t matter anymore. The art world doesn’t miss them, as they are replaced by the next batch of emerging artists. However, any format is interesting to enter into. It is always a challenge how to read that format and where to find one’s form in correlation with that format or against that format. Many biennials are transformed into foundations, such as the Gwangju Biennale and São Paulo Biennial. Wouldn’t these foundations be the place for construction or creation of an autonomous space? Autonomous spaces cannot be constructed. They can only be struggled toward. There is no non-precarious autonomy. In Gwangju, the model has been a kind of ‘readymade politicality.’ I do not believe that this results in effective politicality, however. I am more sympathetic to Gwangju, now that I have lived here for a few weeks and gotten to know the context a bit. The politicality of the Gwangju Biennale, though coming out of its historical inception, the May 1980 uprising, is an attempt to connect what is a rather myopic Korean art scene to an international discourse. Nevertheless, the Gwangju democratic struggle seems the coin that you pay with when you invite artists from elsewhere and it remains a question, whether and how the politics of the biennale are related to the city and contemporary Korean political debate. After the economic decline and the ferry disaster, the overall feeling here is one of depression. People are sad and there is a lack of political vision. How to go on? In this context, the celebration of the 1980s democratic struggle by the rhetorics of Gwangju Biennale seems a bit hollow. We cannot deny that biennials have become hegemonic and in some cases monolithic. However, in places with limited facilities to take care of art, they serve as temporary infrastructures for validation, legitimation, and ultimately production. Do you think another form of education, say in the curatorial field, exhibition making, artistic production, can emerge from this model? How does this kind of education reconcile with the short-term commitment and temporality of the biennial model? From my perspective, the amount of rhetorics within the art world is inversely proportional to the amount of actual productive, innovative, educative progress going on. In other words, yes, of course biennials can produce new models, ideas, practices, but I don't see that the biennial system is especially prone to do so. Picking up on what you highlighted in institutional models, perhaps we can tease out historiographical models. Two of your lectures attempted to ‘politicize the line’ and import the notion of migration (perhaps the political dimension of it) into art form. They seem to address another modernism, different from Clement Greenberg’s articulation. Is there anyone left today who has not recognized the fact there there were many different modernities? Some of them stand in relation to each other, but they do not necessarily coexist in the same timeline. This raises the question of how to show work from different modernities in one exhibition, without losing locality and specificity, which are important in reading works. An intelligent way of tying these works and contexts to each other does not necessarily prescribe to a genealogical linearity. I think of my own style of curating as led by a dialectics and by a mode of additions: ‘This and this and this and…’ or ‘This, but also that and its third.’ For example, I claim that we must strive for both, an emancipated audience as well as in the autonomy of art, despite the fact that they seem to exclude each other. In fact, I believe that the curatorial work is to struggle to bring these two together, even though they don’t necessarily go together. So you have to create a situation in which they can relate with each other, though not necessarily in harmonious way. The only way I have been able to do that is through a dialectic perspective and via a method of additions, of piling works and concepts on top of each other – working and thinking with the and-and-and. To me, this does not mean that everything is somehow harmoniously interrelating, but that one is forced to keep moving and looking at work from an ever-slightly different perspective. I think that art can only be political in a situation where it is made political. The political can never be something that is coming from individuals; it always needs to be coming from a group or more than one person. The political is something that happens in real life. So, the relation between art and the politics is a complicated one. It is not something that can be done solely by putting political context into art. Sometimes, for instance, a feminist work of art is not feminist because it is not in a feminist show. It is read in different registers. A work that is not feminist at all can be political in a show with feminist perspective and feminist discussion. The quality doesn’t lie only within the artwork or outside the artwork. It is somewhere in the relationship between the artworks and the outside. Peter Osborne, in his last book Anywhere or Not at All: Philosophy of Contemporary Art (2013), put forward a speculative proposition that contemporary art is post-conceptual art. Do you agree with him? Peter Osborne gives us a philosophical model for reading contemporary art. But, he is highly critical of the term contemporary art in its ideological formations. Moreover, from a philosophical point of view, the term ‘contemporary’ can only be adhered to retroactively. It is a very weird thing to say that something is contemporary. Take the periodization of contemporary art. Osborne shows that there are diverse definitions when it started, corresponding to ideological political shifts: after WWII, after 1968, after 1989. Who knows, we might soon have another periodization that will correspond to the era of the new fundamentalisms. Osborne relates the constant talk of the contemporary to the capitalist need to construct the world as one where everything is connected. But actual experience is much more fragmentary than what ideology tells us it is. Basically, Osborne is saying that contemporaneity is very much connected to a certain form of capital travelling. He is against aestheticization, not the aesthetic per se, for that would be absurd. The aesthetic cannot be ‘conceptualized out’ of art, because then art would cease to be. Every work of art somehow materializes, even the most conceptual of works. Post-conceptual art accepts this aspect as a given, but strives to show the object in an anti-aestheticed or anti-fetishized form. You have also been problematizing the notion of migration of forms through the curatorial. It would be interesting to add digitalization to this set of questions. What do you think of online exhibitions and printed material as exhibitions? When I first looked at contemporary art in China in 2003, I noticed that there were a lot of painters doing video works and video makers doing painting. This was not because they were conceptual or did not care about media specificity, but the discourse was a different one than in the West. I also noticed that there was something strange and to me inexplicable going on on the surface of Chinese paintings. The language of paint applied on a canvas, which has evolved in a particular and highly complex way in Western art history, had an entirely different language in Chinese works, which often seemed almost three-dimensional, so generously was the paint spread on. Because traditional Chinese painting is ink painting, the language of oil paint is a new one, developed in weird correspondence with what Chinese artists perceived to be Western art in the 80s. Remember that they first saw Polke or Richter in the form of reproductions on the printed page. So though there is some mimicry going on, the Chinese painterly surface is a relative new, highly creative invention. To draw an analogy, the question is: What is (and what can be) disseminated via the digital? And to what effect? Historical marks are connected to historical periods of art. Since 1989, we are observing this global internationalization of art and based on the perspective of history of art; we begin to look through the history of exhibitions and artworks. What do you think about it? Exhibition histories are relevant, but the fashionable discourse of it gets on my nerves. However, it is interesting that people strive to compare exhibitions with each other, for people have historically learned from each other. Intertextuality within curating has been a neglected theme in exhibition studies. At the end of 1990s, it became fashionable to look at former modernisms or former teachers’ works, then reenact them. It is as if people are not able (or afraid) to figure the present moment by themselves, through present means. Maybe this is a result of over-education or of the professionalization of the field of art and curation? Related to the study of exhibition history, what is the method? Is this another interdisciplinary method? We are interested to know your position on the reading of a curatorial practice. What must be looked at? As much as one can from as many different angles as possible. Too often, the documentation of a show, whether through the media or though the exhibiting institutions themselves, makes for false reduction or reification. To give an example: the low lighting in the cabinets of the Neue Galerie at documenta 12 was interpreted by critics as the curator’s regressive desire for the aura of the object. Had they asked around, they would have learned that the low lux due to conditions spelled out in loan agreements. Often, there are highly pragmatic reasons for decisions which are read as curatorial poetics. I am most interested in experimenting with highly subjective forms of documentation. For documenta 12, we produced a picture book consisting of photos of the exhibition taken by artists who use photography in their own practice. You will encounter many details, many fragments in this book. The text of the exhibition produced by this book seemed very adequate to us, but it turned out to be highly unpopular with the public. We are still so used to the scopic form of vision that photographic representations which do not adhere to this mode still irritate. It is uncomfortable to be confronted with lack. But isn’t it true that only by recognizing lack, can we begin to see? 1. See Ruth Noack and Roger M. Buergel, ‘Some Afterthoughts on the Migration of Form,’ Afterall Journal 18 (Summer 2008). Manoel Silvestre Friques (1982, Rio de Janeiro) is an Assistant Professor at School of Engineering at UNIRIO, Brazil. He is a PhD candidate in the History of Art programme at the Department of Social Cultural History (PUC-Rio). He is currently a Visiting Scholar at the Department of Art History and Archaeology at Columbia University, New York. For the past decade, he has been involved in various Brazilian cultural projects either as curator or as dramaturge.